Description: A BNSF unit coal train slows as it enters the old NP yards on the MRL. The train will be broken in 2, and the MRL helpers will haul the second half of the train over Bozeman Pass. My son Nathan took this photo, and it was a grab shot at that! Description: BNSF's daily Q-PVDV-J performs a running air test before leaving Provo for the mile high city. Description: Rolling through Guernsey with an intermodel. Description: Three GEs in three different schemes cross over the Trinity River on the way out of town at sunset. 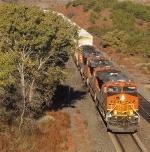 Title: BNSF 7595 rips past the lookout point in la plata mo. Description: A mixed BNSF freight rolls past the Dallas skyline en route to Houston. Description: A westbound BNSF stack train runs under a classic Santa Fe signal bridge in July 2012. Replacement signals stand at parade rest nearby, ready to take over when the call comes. Description: BNSF 7354 leading an eastbound freight train under Highway 138, in the location know as "Mormon Rocks"
Title: BNSF 7455 Rips a EB stack train out of La Plata Mo under Blue Skys! Description: EB stacks run wrong main! Description: UP's MCXEW-03 (Manifest CSXT Connection New Orleans, LA-Englewood Yard Houston) heads west on UP's Lafayette Sub. Description: BNSF 7354 is seen at Westville, NJ.